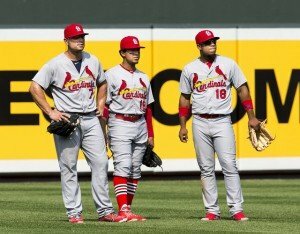 The St. Louis Cardinals clinched the NL Central for the second straight season, before even taking the field Sunday with the Pittsburgh Pirates losing. Pittsburgh lost 4-1 to the Cincinnati Reds to give the title to the Cardinals. Johnny Cueto (20-9) shut the Pirates down getting his 20 win of the season, he pitched eight innings, and gave up one run. The Cardinals where going to start Adam Wainwright (20-9) today, but decided to start relief pitcher Nick Greenwood instead after finding out they had clinched. Pittsburgh will now have to play in the Wild Card game Wednesday at home against the San Francisco Giants. St. Louis will travel to play against the Los Angels Dodgers on Friday October 3. The Cardinals will have a tough road if they want to make it to the NLCS, as you can think Clayton Kershaw will start at least two games against them.